1st Position - Install the middle headrest separator, so the baby can stretch out with his head higher than his body. 2nd Position - Attach the middle separator to the Velcro in the middle of the bath base, so the baby can sit up and the separator will act as a safety bar to stop him from slipping. 3rd Positon - Remove the middle separator from the bath base so the baby can be more comfortable. Exclusive designed inflatable plastic bath that considers the comfort and safety of your baby right from birth. Designed to grow with the baby. Fitted with a separator to prevent the baby from slipping. The separator has a removable piece of Velcro making it quick and easy to change the space inside the bath. As it is inflatable it is very comfortable for the baby. Material: PVC plastic. Phthalates free. Decorated with non-Toxic paints. A very practical, convenient and safe bath for the mother. With amusing shapes and colours for the baby. Fitted with a separator to prevent the baby from slipping. The separator has a removable piece of Velcro making it quick and easy to change the space inside the bath. 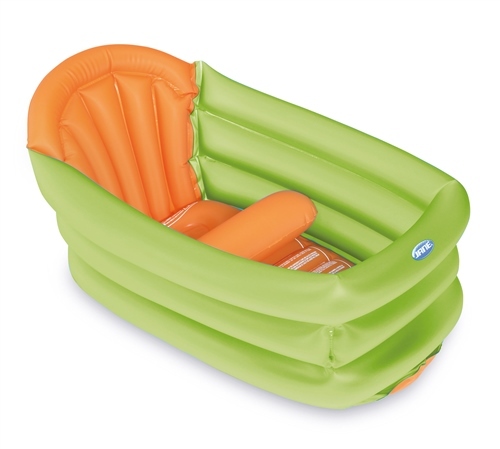 As it is inflatable it is very comfortable for the baby. Dimensions: Long 78 cm x Wide 43 cm x High 37 cm. These measurements are a guide only as it depends how much the product has been inflated. Designed for travelling. When packed it takes up very little space. Top quality highly resistant material, with 4 safety valves. Ideal size for a bath or shower base! Decorated with nontoxic paints. Phthalates free. Really nice for baby bath. Fast to fill in. Easy to use, excellent for the beach or traveling. My Baby loves it. Great item!! We can use in garden and in our shower as we don’t have a bath!! She loves it! !